I'm very happy for Lost in Light to be part of MountainFilm on Tour and MountainFilm for Students. Mountainfilm travels year-round and worldwide with a selection of current and best-loved films from the annual festival in Telluride. MountainFilm for Students plays educational, entertaining and inspiring content for students all over the world. The playlists focuses on compelling educational and inspirational documentary short films to get students thinking. These playlists target films that are timely, regionally relevant, or topics not commonly discussed or seen. It also makes me very happy that the MountainFilm on Tour poster has my 'Milky Way over Crater Lake' image as a backdrop. I’m extremely happy for this film to be part of MountainFilm for Students. Astronomy has inspired so many people throughout our history from Artists to Poets to Scientists. I think that we have lost the potential for thousands of great minds these days. Millions of children will never see a sky full of stars or the Milky Way. It is very important for children to be fascinated by the night skies and exposed to Astronomy. The nice thing about Astronomy is that it makes you ask questions. And when kids ask questions, they learn more about our surroundings and the world we live in and beyond. My short films on Light Pollution have been very successful - featured on Nat Geo, made the news in over 40 countries, seen over half a million times, used by NPS, schools and scout clubs for education and outreach and screened at film festivals. It spurred a conversation on Light Pollution, its effects and what we can do to fight it. When I attended the San Francisco Green Film Festival earlier this year, I realized how much people care about Environmental issues. I was inspired to make my own Documentary movie on Astronomy and Light Pollution. I wanted to make a movie on the significance of Astronomy and the night skies, the effects of Light Pollution on Astronomy, human health, wildlife and beyond, what we can do to fight it. I reached out to the International Dark-Sky Association(IDA) about the idea and they were so impressed that they asked me to join them. 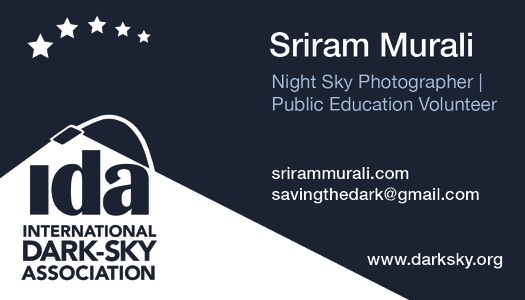 I've been a Public Education Volunteer for the International Dark-Sky Association for a few months now. I'm proud to be a part of IDA and it has only made me more responsible. My drive to do something about Light Pollution has definitely increased several folds. Thank you IDA. The movie, 'Saving the Dark', will show what the people in cities are missing out on, the importance of Astronomy in our lives, the impact Astronomy can have on children, how Light Pollution costs a lot of money, affects our health, wildlife and our environment, show the work of nonprofits fighting to preserve dark night skies, tell what people can do at home to fight Light Pollution and talk to cities that have successfully handled this issue. The movie is going to be completely non-profit, made only for educational purposes. I do this out of my passion for Astronomy and the night skies and the drive to make people care more about it. I give my videos out for free for educational purposes and don't make any money off my photography. This project is funded by me, done solely on my personal time. I've had so many great experiences and met the friendliest bunch of people over the past several months working on this project. I've got so much love and support. I’m interviewing and showing the work of folks at International Dark-Sky Association, National Park Rangers, Sea Turtle Conservancy, Audubon Societies, Astronomers, Star parties, Public Utilities Commissions, University Professors researching lighting and young children passionate about Astronomy. I want to thank all the non-profit organizations and other people that have helped me on this project. I will be adding short stories on each of my experiences in the coming days. Thanks for reading. Clear skies. This was my first shot of the Milky Way shot 2 years ago. I only had entry level gear, a flimsy $10 tripod, not much experience shooting with a DSLR and the first time shooting alone in the dark. But, one thing I did really well was planning. I scouted Google Maps for the best location(facing the mountain from N to S), picked the best possible day(weather, moon phase), time(2:30 AM when the Milky Way is almost vertical, this was in March), woke up at 1:30 AM and got the shot I wanted in just a few minutes, thanks to the meticulous planning. I even knew where I’d park the car and put the tripod before I even got there. I’ve taken many more photos and videos of the night skies since, but this is still one of my most favorite images. I’ve come a long way since with better gear and techniques, but it’s definitely the planning that has helped me stand out - featured on Nat Geo and several leading magazines/news and recently selected to be screened at film festivals. I cannot insist enough on how planning is more important than anything else to get great shots of the night skies. Thanks for reading. My short film on light pollution was selected to be screened at the Environmental Film Festival at Yale and the San Francisco Green Film Festival. The film’s reach has been nothing short of amazing - featured on Nat Geo, screened at film festivals highlighting environmental and social issues of our time. So many policymakers, educators, observatories, scout clubs, non profit organizations including the National Park Service have reached out to me to use the film for education and outreach. Hearing from common people changing their lighting choices after watching the film makes me feel very optimistic. To have a special liking for Astronomy and feeling sad that light pollution is ruining it is something. But, to have the world turn back, listen and call for action on the issue is something I never imagined. A writeup on how I made the short film on light pollution. I wanted the film to be less than 3 mins. For every location, I spent hours planning the shots/frames on Google Maps Street View, Satellite View and anything else I can find about the location taking out any guess work. I, mostly, look for an interesting foreground. Ironically, finding locations to shoot at higher light polluted areas was more difficult(levels 7,6,5). Most places restrict being there after dark. You'd get a ticket or car get towed. Planned trips to the farther locations around New Moon. I shot between May 29th and August 5th. Once it's dark, take test shots. Zoom in to check for focus, stars streaking. I'm glad this film has got so much attention. It has got people talking about light pollution all over the world. I hope it makes a difference. May be one day, we'll start seeing more stars :) Thanks for reading. I shot in Grand Canyon as part of a time lapse movie in September 2015. Grand Canyon, being an International Dark Sky site, has extremely dark skies. It was very very dark and windy. I setup my cameras(6D and 70D) right next to each other and stood guard to protect against the mighty winds. It had an eerie feel to it with the darkness, a sky full of stars, the insect sounds and a canyon a mile deep centimeters from me. Aug 5th 2016 - Drove for 24 hours and 1,200 miles in 2 days, last 4 hours of which on steep backcountry dirt roads up the mountains, sweltered in 120F(49 C) desert heat, set up tent in gusting winds with sand from the dunes blowing all over the body, no humans in the near 50 miles, hardly any sleep and energy left, running a fever and the fear of scorpions, venomous spiders and snakes at night...All for one reason - Pristine night skies with absolutely no light pollution at the remote Eureka Dunes in Death Valley. The Milky Way dazzled so bright that it cast shadows. We felt like the only beings on an alien planet; such an ethereal experience, hard to come by these days. I’m grateful to my kind-hearted, lovely wife Priya for being an integral part of this crazy trip.